Guilty Gear Xrd Revelator has a great combo trial move that starts off by showing you the motions of every character displayed on a stick, with your inputs juxtaposed directly below the example, so you can compare your inputs to theirs. It even shows when the button is pressed, so you can see that too (more useful if you’re trying it yourself, but still). This helps side-step a lot of the issues beginners have with learning how to do motions and learning notation. Unfortunately, not everyone has access to Guilty Gear Revelator, so not everyone can learn this way. The red ball indicates where your stick/dpad is currently pointing, with the center being neutral, and the 8 dots around the sides being the 8 directions you can point. This is the most basic motion. This is the basis of all the other motions. It’s called a quarter circle, because if you look at the 8 directions you can point in as a circle, it’s 1/4th of the circle. This motion is in every fighting game. Same as the QCF, except backwards. You can use a lot of moves just by knowing these two motions. This is the second most common motion in fighting games, and a stumbling block for a lot of beginners. You’re allowed to input it a bit sloppy, like 63236, just be sure not to accidentally do a double QCF in the process, and to complete the motion before you press attack. 6523 is also a valid way of inputting dragon punch. Same as the Dragon Punch, but backwards. This motion is really uncommon, but it shows up occasionally, and it’s always bizarrely harder to do than a regular DP, even though you’ll be used to doing DPs on both sides from normal play. This gif also shows off a sloppy way of inputting the DP, 4121, instead of a clean 421. And it’s input a lot faster than the others, showing you can do the motions quickly and they will still come out. 4521 is also a valid way to input a reverse dragon punch. Less common than a DP, but more than a reverse DP, half circle motions can be significantly trickier to perform than quarter circle motions, even though they’re only slightly different. These motions are typically used for moves meant to have a bit more impact than a quarter circle move. Same as the Half Circle Forward, just backwards. These are frequently used for weaker command grabs. Charge moves involve holding back for about a second, then tapping forwards and a button. They’re usually a bit stronger to make up for this charge time. You can also hold down-back to charge without moving backwards as you charge. Moving the stick to a position that isn’t back will cause you to lose your charge however, so you need to be either immobile, or walking backwards to charge. This charge move involves holding down, then tapping up and pressing attack. Note that if you’re too slow to press attack, you’ll do a jumping attack instead of your special move. Like with charge back-forwards you can hold down-back to charge and block at the same time. This will charge both charge moves simultaneously, so you can choose to use either one. In Guilty Gear, you don’t even need to press straight up or straight forwards to perform charge specials, you can instead press up-back, or down-forwards, letting you hang onto the other charge. This is the most common super input in fighting games. It’s as simple as doing 2 QCFs back to back. It can be rather tricky, and frequently you can get Dragon Punches if you’re sloppy, or get supers if you’re sloppy with your dragon punches. Same as double QCF, just backwards. Also a really common super input. Tap down twice, simple as it gets. Uncommon input in most games, very common in games by French Bread, such as Melty Blood. 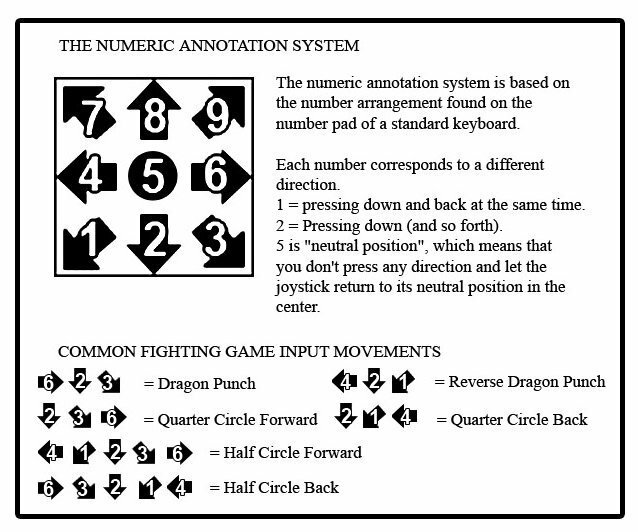 Frequently used as an alternative to the DP input. This is an extremely uncommon input found only in Guilty Gear, Blazblue, and King of Fighters really. It’s frequently used as a super input in these games, and for command throws. Another uncommon input except to those 3 games. This is only used as a super input. It can be tricky, try your best. A fairly common input, limited to grappler characters usually. Even though the instructions generally say to spin the stick 360 degrees, the game actually only cares if you hit all 4 cardinal directions (in any order you want, as long as it’s a complete rotation). An easier way to perform this move when you’re learning it is to do a half circle back, then tap up. Since you need to tap up at some point during the input, if you’re too slow to press punch, you will jump. This means it’s generally easier to do 360s when you’re already jumping in on your opponent, or dashing, or doing some other action that will prevent you from jumping.